Thirteen SUNY New Paltz students attended the SUNY Model European Union Simulation, held Jan. 11-13, 2018, at Vesalius College in Brussels, Belgium. Pictured: (front row, left to right) Annabel Newman, Sophia Urrutia and Desmine Romnaelli (back row) Nikki Donofrio, Jenna Chippendale, Kevin Jimenez, Rachel Brown, Halle Shepard, EU faculty advisor Kathleen Dowley, LaLa Mieses, Matthew Stephens, Cheyenne Dietz, Matt Morales and Matt Delaney. A delegation of SUNY New Paltz students participated in the SUNY Model European Union (EU) Simulation and Study Mission in Brussels, Belgium, a unique experiential learning opportunity that allowed students to engage with policymakers and debate the critical issues facing Europe today. Thirteen students from the College of Liberal Arts & Sciences represented New Paltz at the SUNY Model EU, which was held at Vesalius College in Brussels. They worked alongside nearly 150 peers from the SUNY system and from European partner institutions, representing national delegations and playing the roles of real political figures from each country’s government. 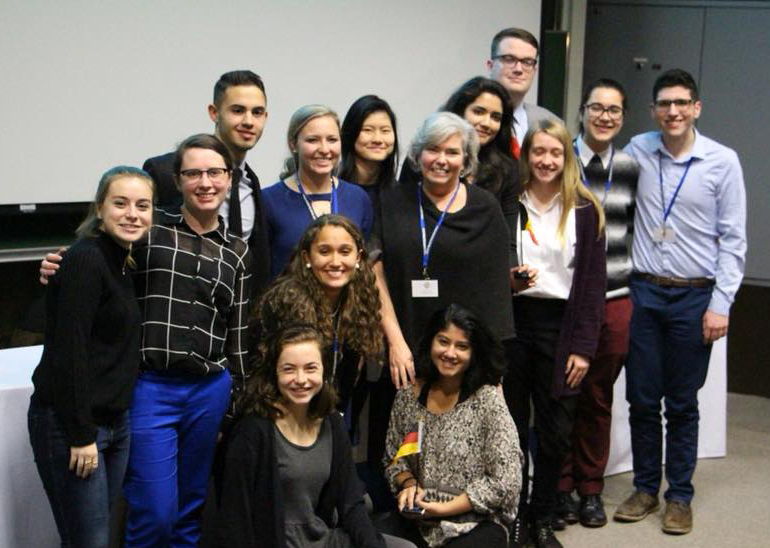 New Paltz students made contributions on three country teams (Germany, Malta and Belgium), as they debated EU responses to the migration crisis and deepening defense cooperation among member states, among other issues. Matthew Delaney ’19 (Political Science, History), channeled Peter Altmaier, Germany’s acting finance minister, in an Economic and Financial Affairs Council simulation. He debated with other students representing the economic and finance ministers within the European Union, on subjects including Greece’s debt restructuring and economic solutions to the current refugee crisis in the EU. “Everyone did such a great job actually presenting as their role, and made the simulation much more realistic and immersive,” Delaney said. The location of the Model EU simulation alternates between New York City and Brussels. For the last three iterations in Brussels, Associate Professor Kathleen Dowley, who has directed the model EU program for SUNY New Paltz, added an optional, three-credit study mission supplement to the simulation. The 11 students who enrolled in the study mission this year, joined by peers from Albany and Ithaca, stayed an extra two weeks to attend briefings at EU institutions, Belgian national and local institutions, NATO and local NGOs. Read more about the SUNY Model European Union on the Department of Political Science and International Relations’ website: https://www.newpaltz.edu/polisci_intlrela/meu.html.